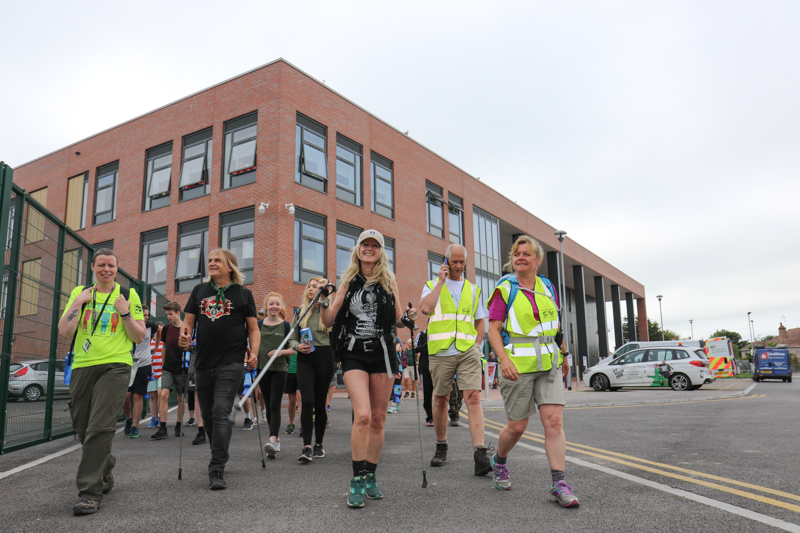 Day Six and it’s back to school for Mike Peters and the By Your Side team. 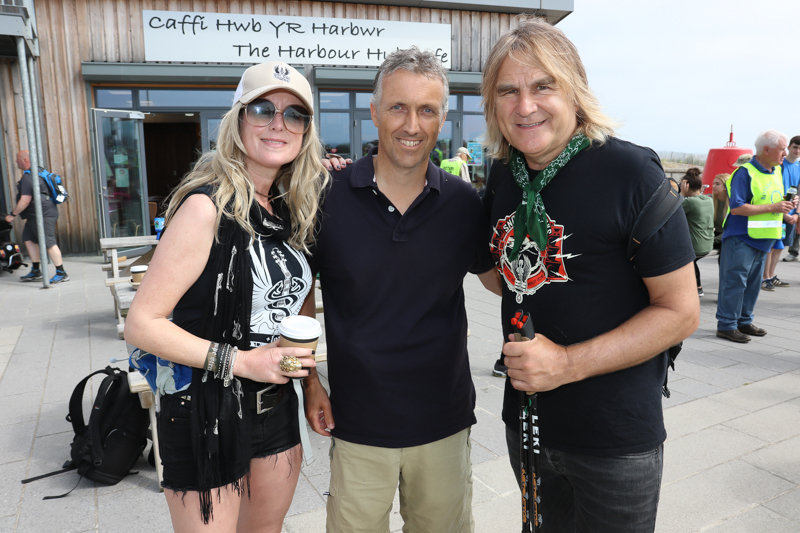 Mike Peters admitted to feeling nervous about addressing pupils and staff from his old stomping ground of Rhyl High School which has recently been the beneficiary of multi million pound refurbishment. 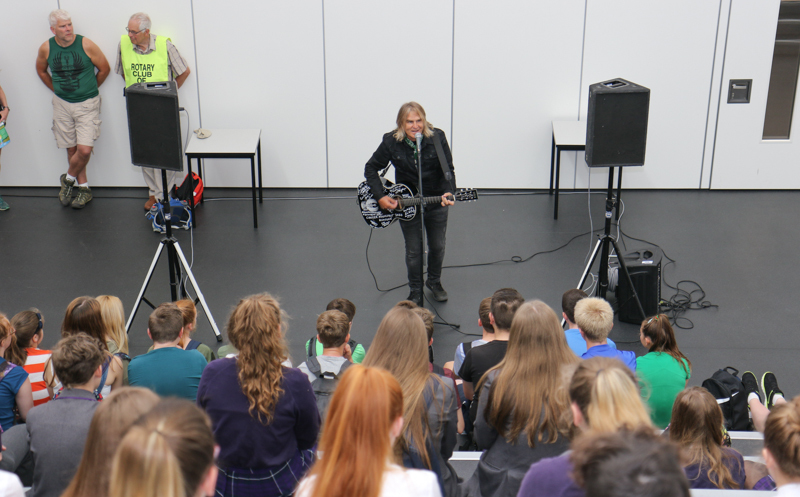 In the new quad building Mike Peters spoke of the progressive nature of Rhyl High School and how his life was transformed when one of the first ever computers to be used in UK education was installed in his Mathematics class, enabling Mike to sit and pass the first ever British O-Level course in Computer Studies. 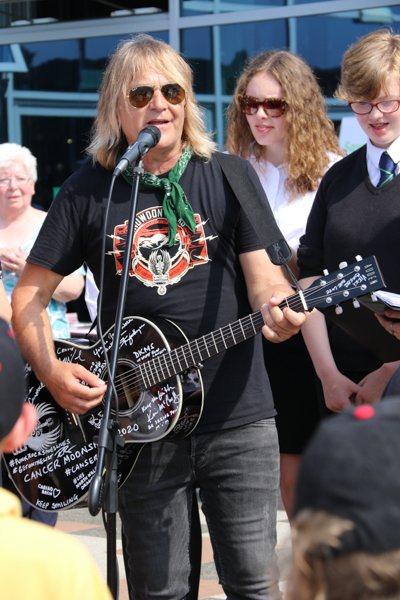 His speech was based on the theme of determination and how the beginnings of The Alarm actually gave to life when a Geography Teacher, affectionately referred to as ‘Pete Geog’, asked if any pupils could play guitar and a young Mike Peters put himself forward. 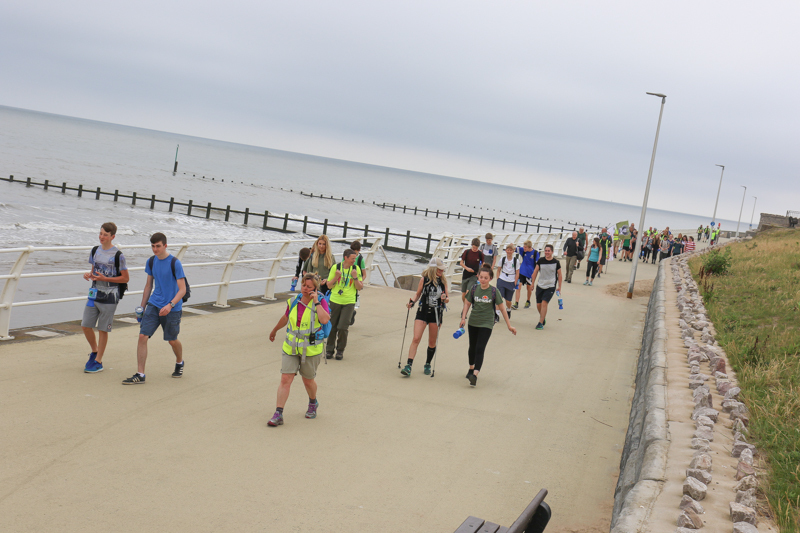 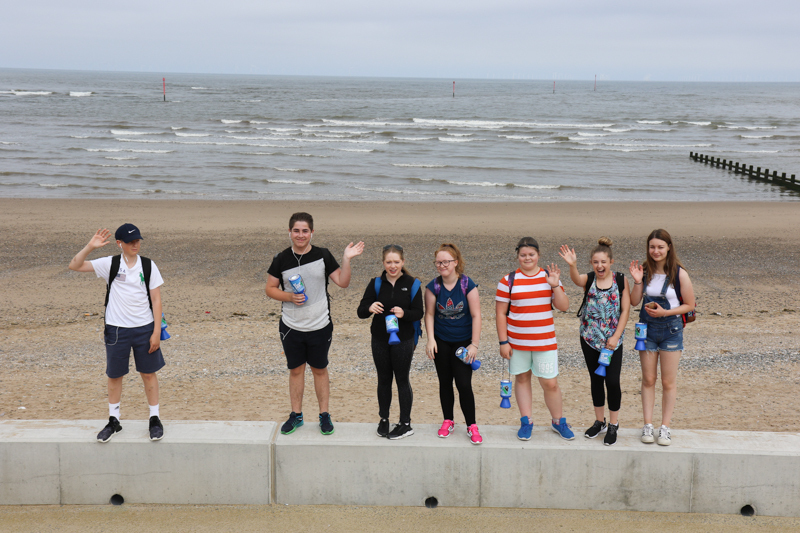 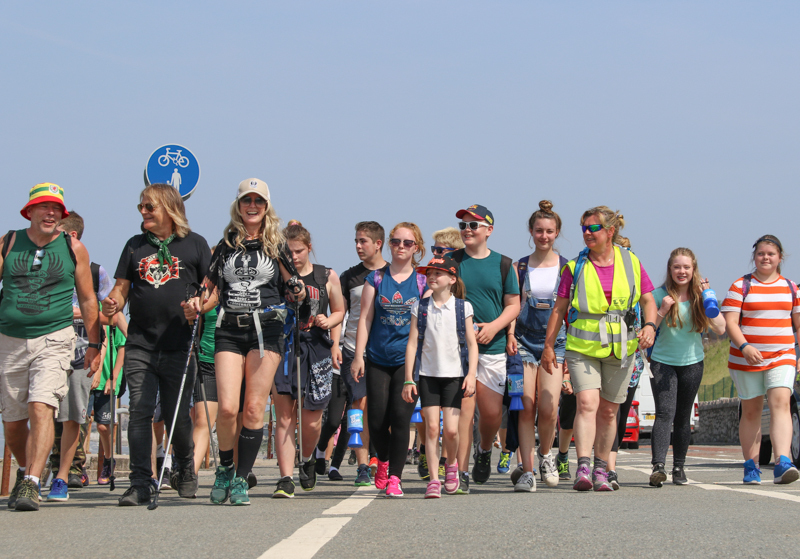 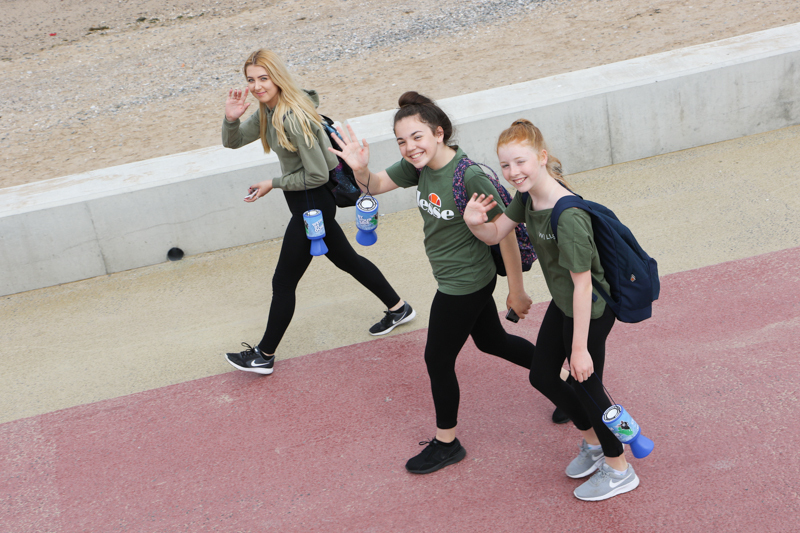 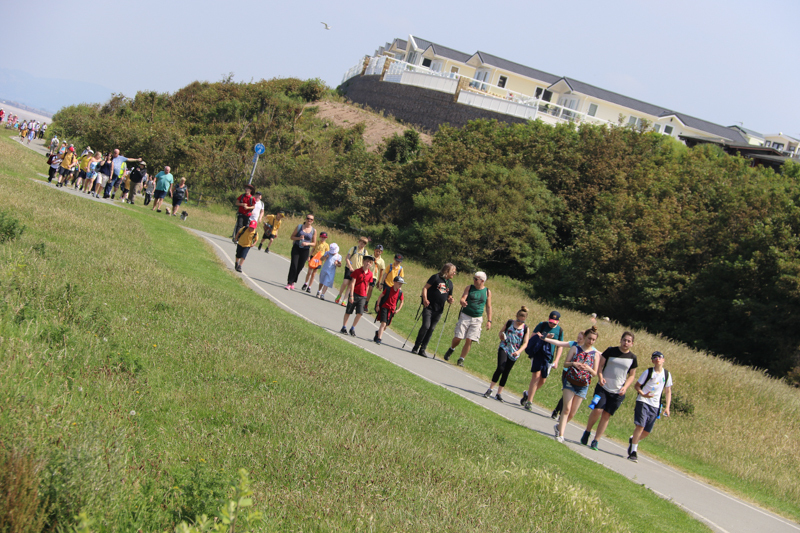 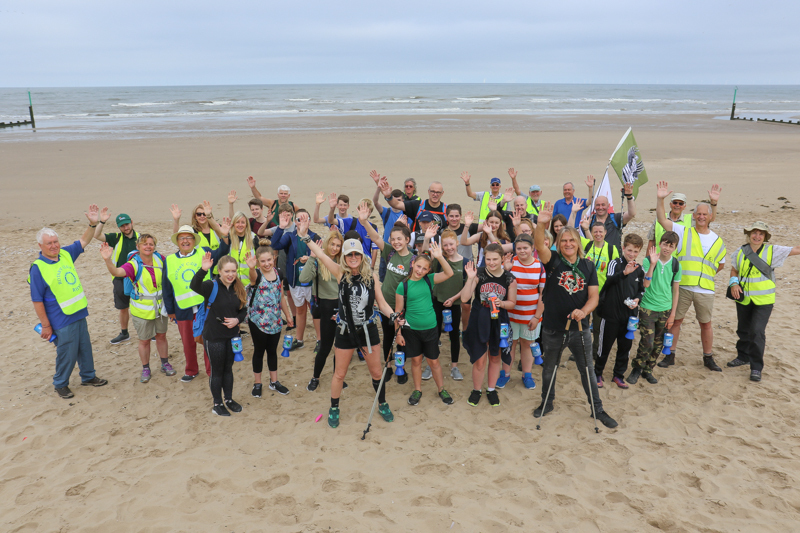 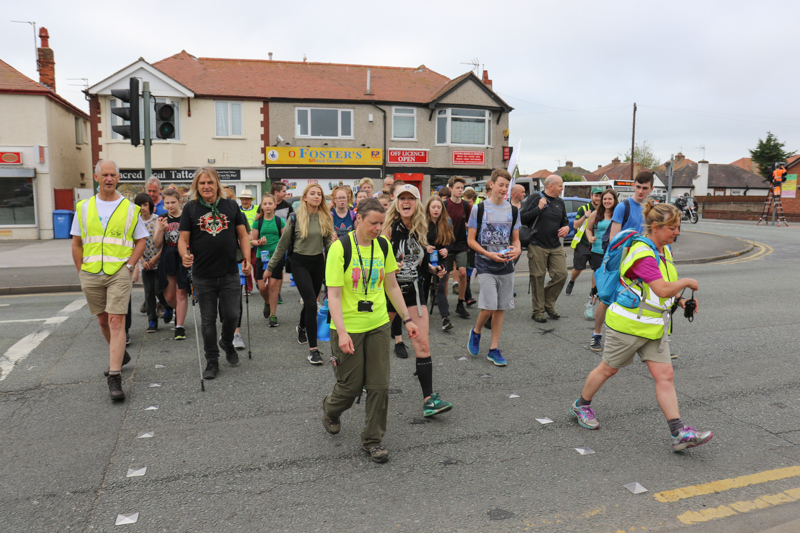 So with determination and a host of committed Rhyl High School students and teachers (some of whom were engaged in their own struggles with cancer diseases), made their way through the backstreets of Rhyl and on to the promenade. 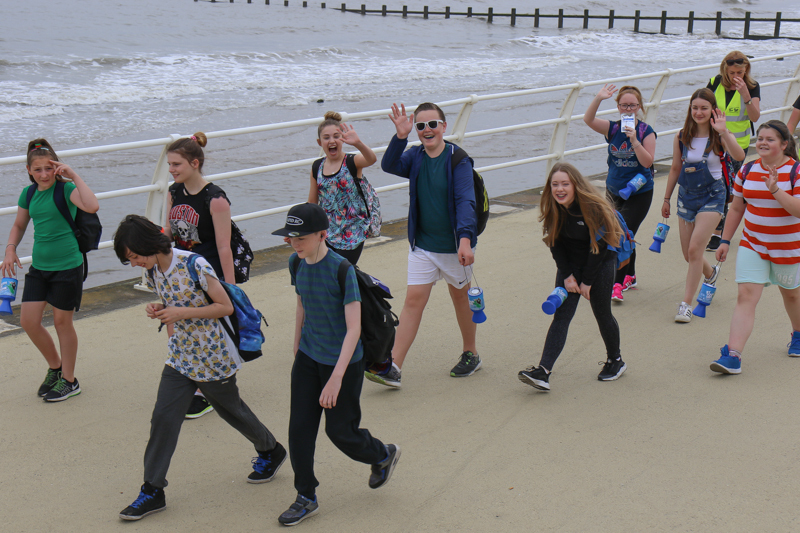 It was another beautiful day to be alive, as the the town lived up to it’s nickname of Sunny Rhyl. 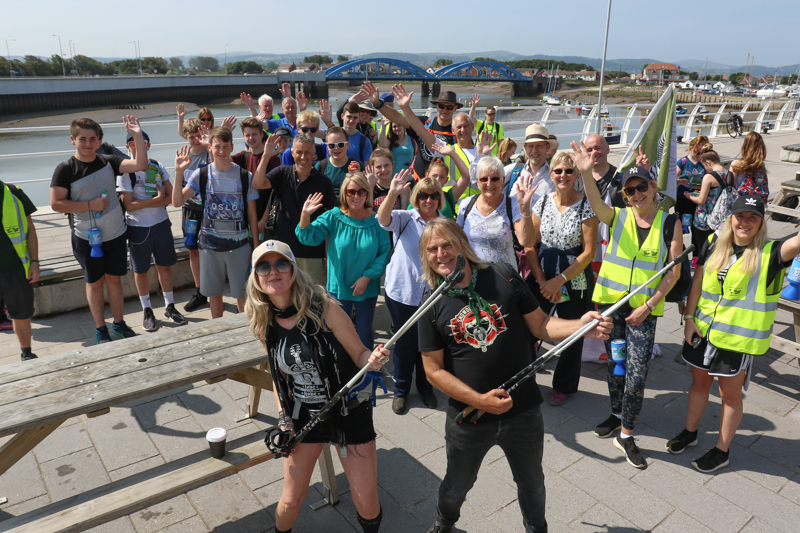 The group were bound for the Foryd Harbour, which happens to be the site of the Mike Peters ‘metallic’ statue that was unveiled a few years ago in honour of members of the Rhyl community that had made significant contributions to the town’s history and-well being of the world at large. 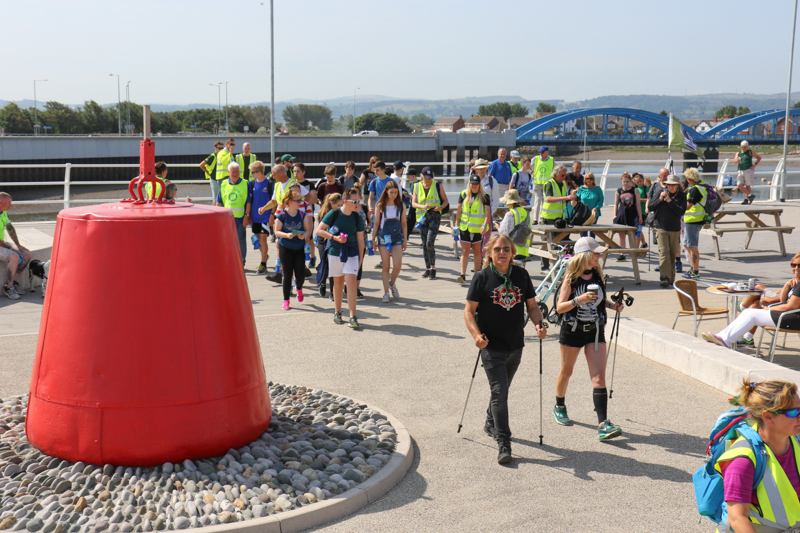 It was here that the entourage crossed the Pont Y Ddraig bridge to be joined by television news cameras and photographers along with a welcome slice of toast generously provided by the team at Hub Cafe. 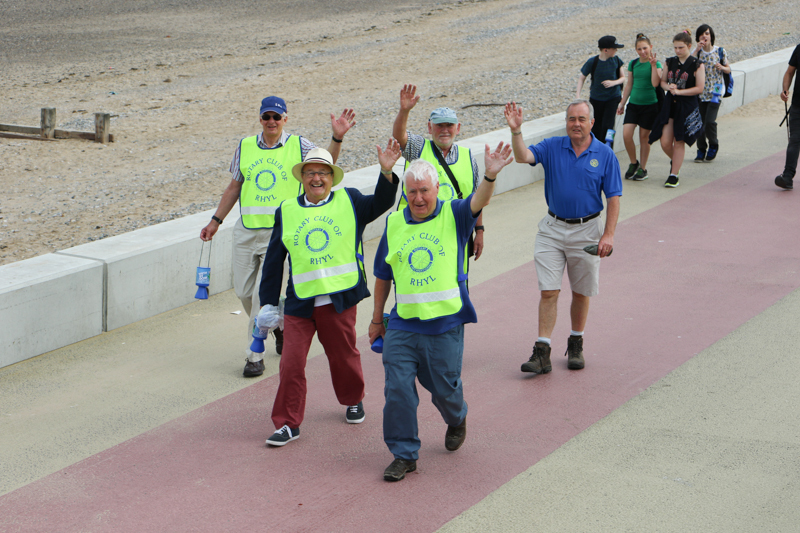 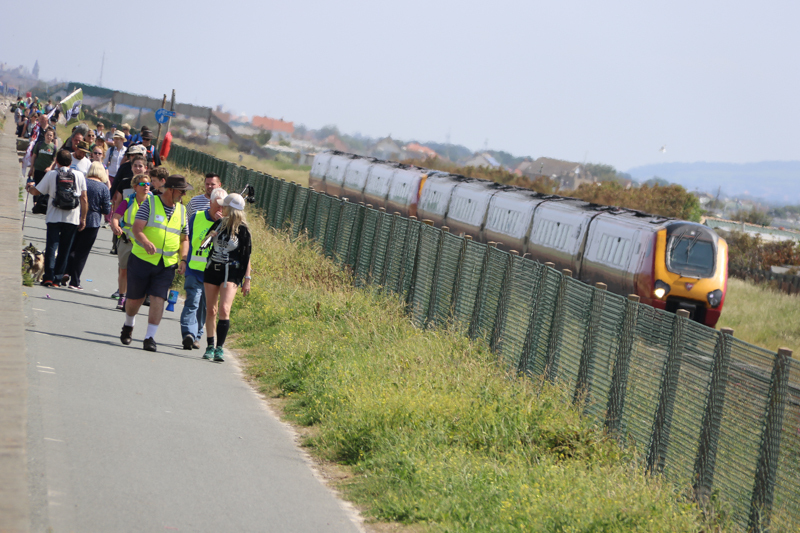 From here, the team was swelled further by members of Rhyl Rotary Club as they set off along the Welsh Coastal path in the direction of Pensarn and Abergele. 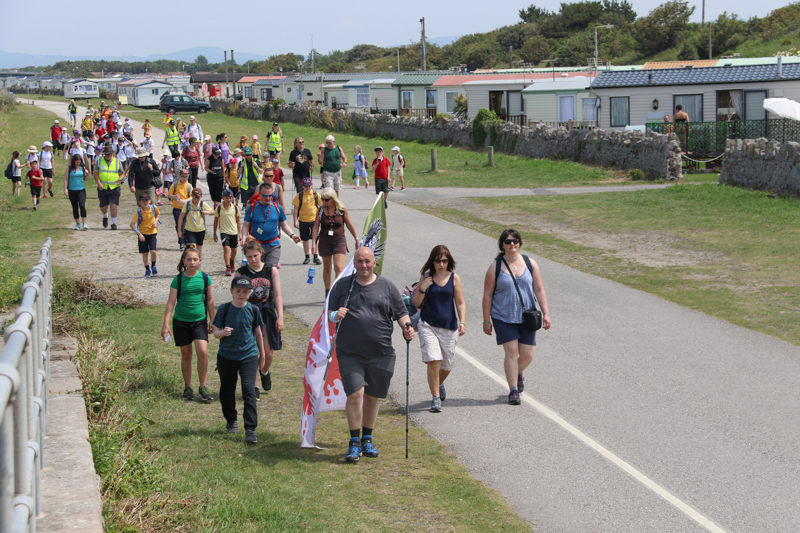 It was a beautiful day walking alongside the white sandy beaches, flanked by rows of caravans some of which could easily lay claim to having the best beach views in all of Wales. 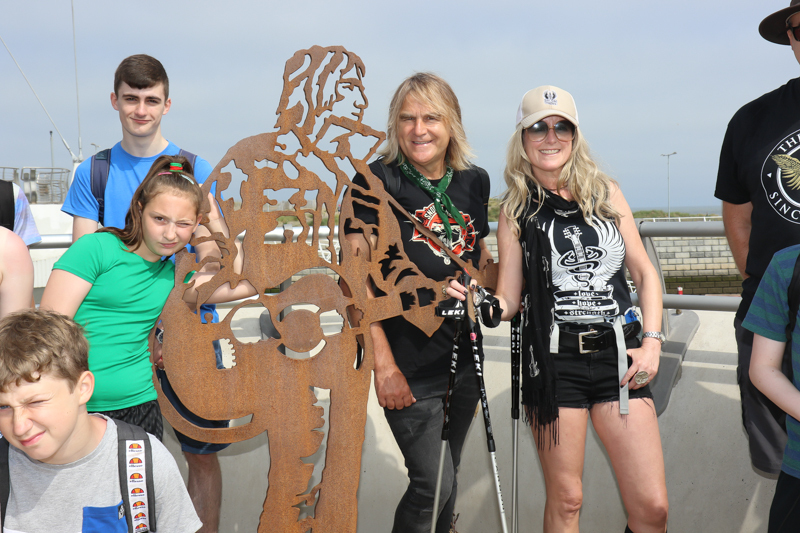 Mike and Jules Peters were surprised at this point in the walk by the appearance of Dr. David Gozzard the now retired consultant who first diagnosed Mike with cancer back in 1995. 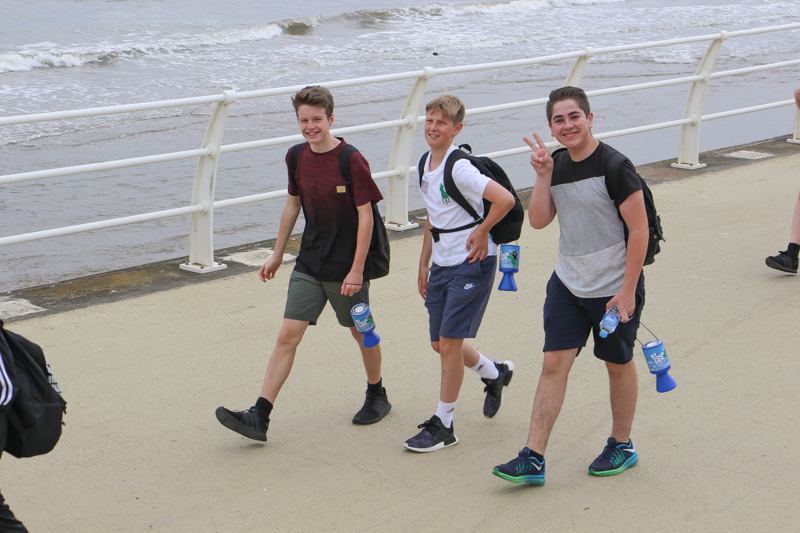 There was obvious kinship between the three friends, especially after all that has happened since. 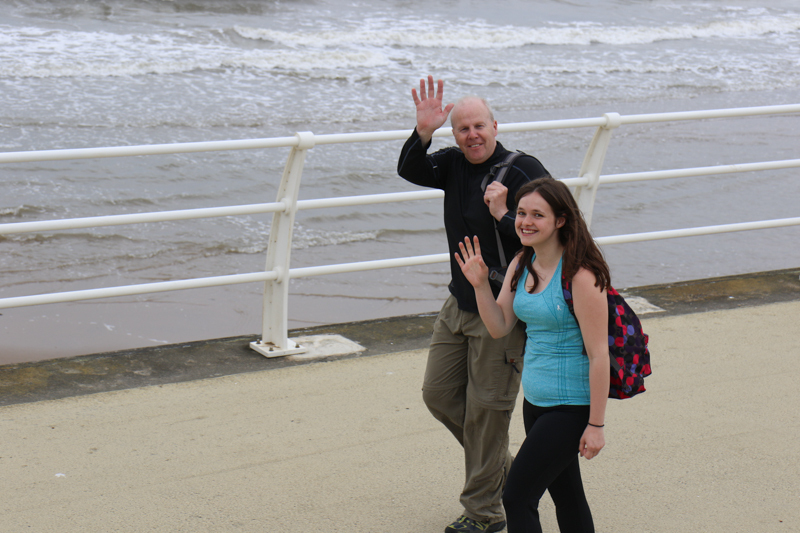 Dr. Gozzard was also part of the team that nursed Jules through her Deep Vein Thrombosis incident in 2009. 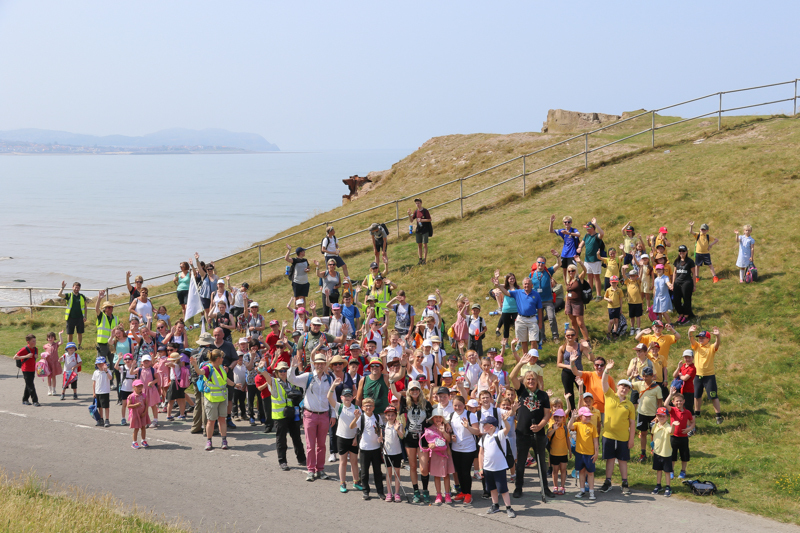 Even more young children from the local primary school joined the route and greeted the procession with an accapella Love Hope Strength. 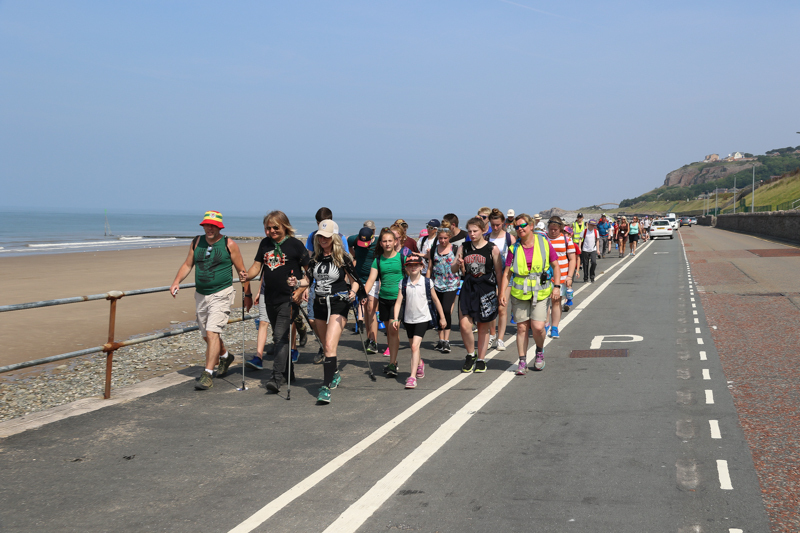 At the halfway point in the walk there was a stop at the Beach Cafe in Pensarn for drinks and sandwiches which re-energised the party for the final push along the glorious Welsh Coastal Path and all the way into Colwyn Bay. 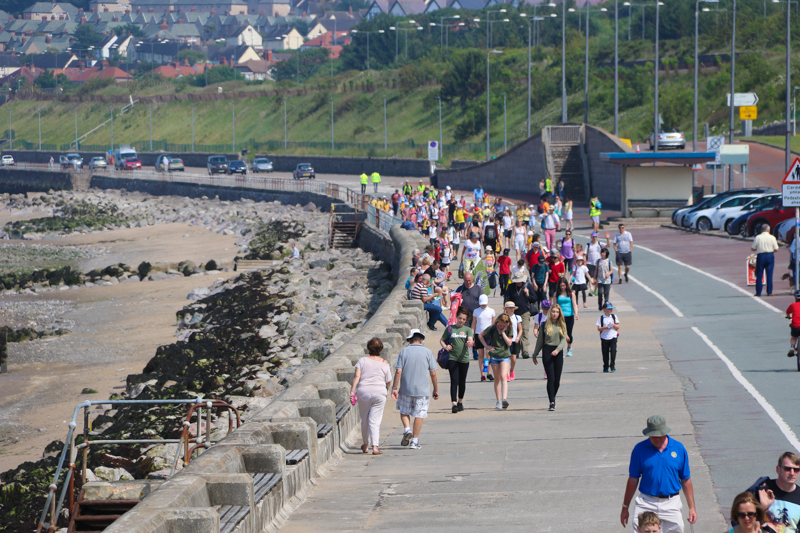 The destination for today’s finale was Porth Eirias, which happens to be the beach restaurant of Welsh Celebrity Chef Bryn Williams and upon arrival, there was a fantastic atmosphere to greet the eclectic band of hikers as a choir of students from St. David’s College in Llandudno serenaded everyone who crossed the finish line. 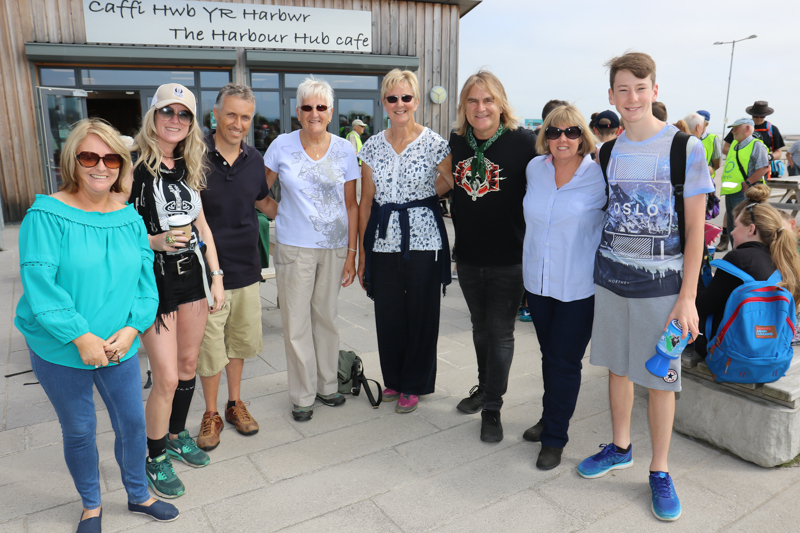 “Welcome to the Welsh Riviera”, said Mike Peters as he thanked everyone who had walked with him and spoke of his gratitude for the magnificence of the welcome and praised all who committed to the cause and raised funds through the By Your Side Appeal message of Love, Hope and Strength which was amplified with a rousing communal sing song of the campaign anthem. 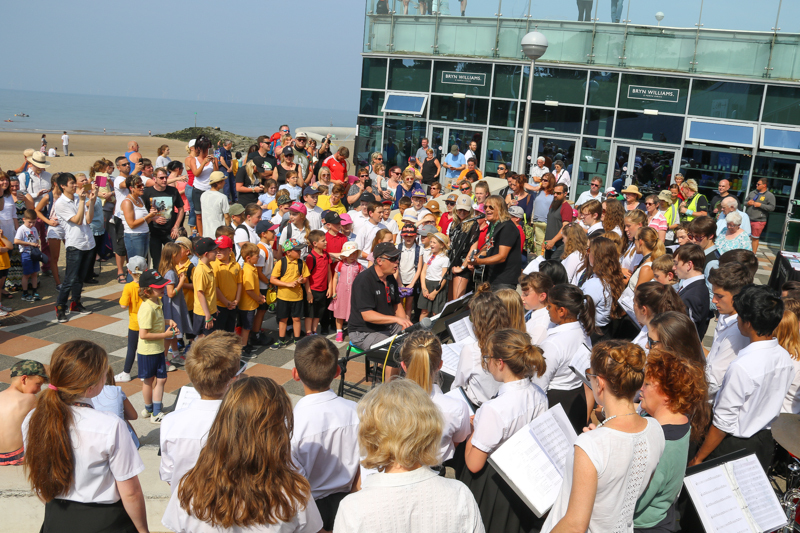 Later that evening, Bryn Williams team at Porth Eirias held a fund raising dinner for Awyr las / Love Hope Strength that was to be punctuated with a themed menu and speeches. 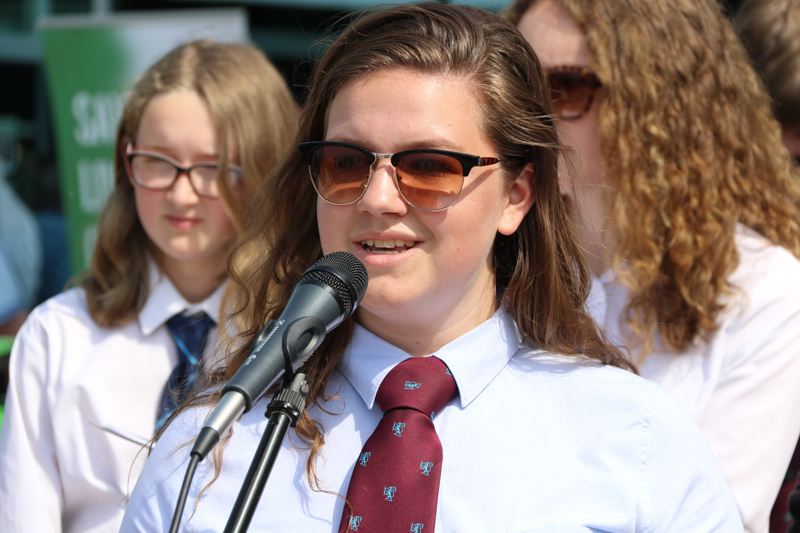 First to address the well dressed audience of fine diners was Bryn Williams himself who spoke on the theme of ‘Love’, as expressed by his lifelong desire to bring flavours and dishes together in inspired ways through his love of cooking. 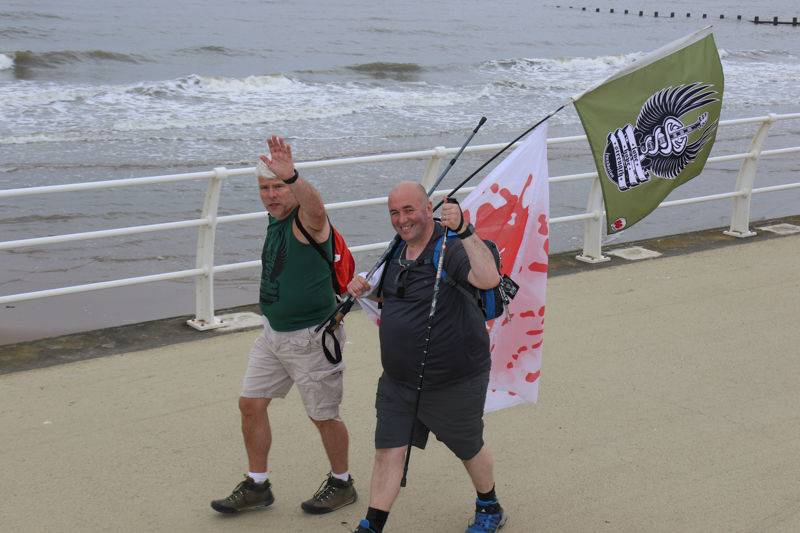 In between courses, those lucky enough to have got Gala tables were treated to a magnificent speech / lecture on the history of cancer by Mike Peters’ own Haemotologist – Dr. David Edwards, who highlighted the ‘Hope’ for humanity by illustrating just how far we have come in a relatively short space of time, and how close science is to tackling the disease that now affects one in two people throughout the world. 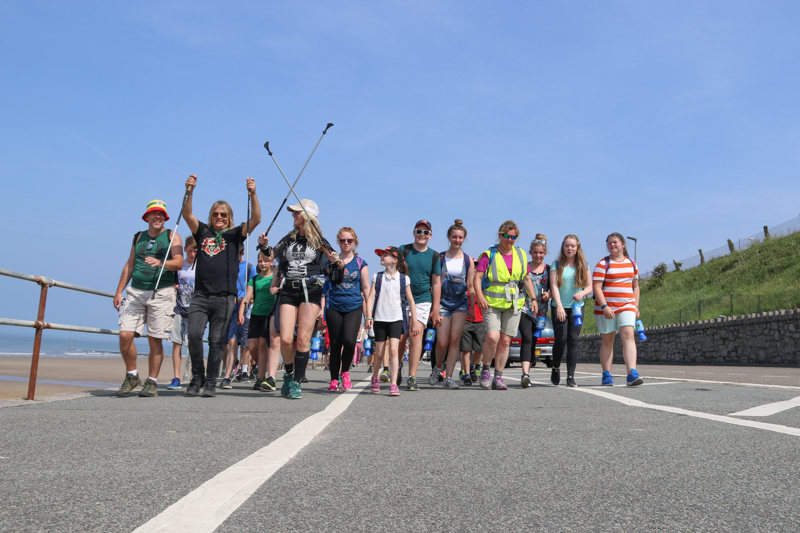 Bryn Law from Sky Sports spoke of ‘Strength’, and highlighted the power it can have on a group of people working together with a common aim. 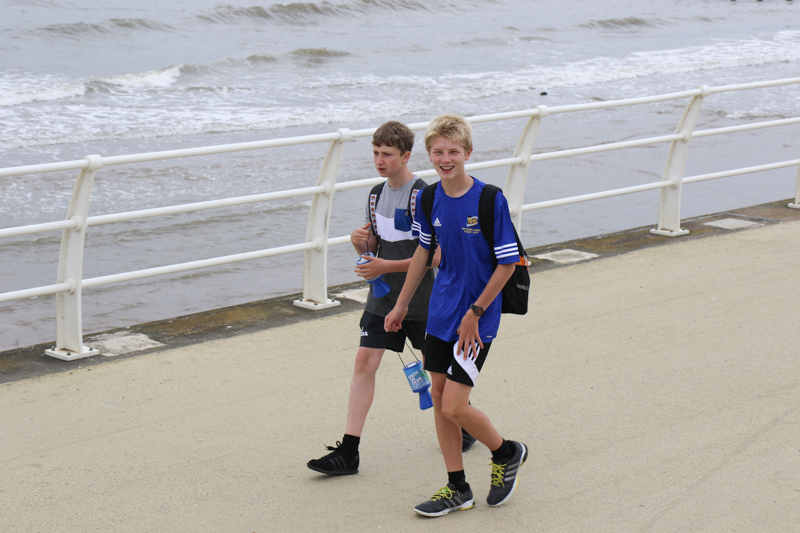 Using a compelling story of being in the tunnel with the Welsh soccer team as they took to the pitch with each and every individual coming together / #strongertogether to carry the hopes of a nation. 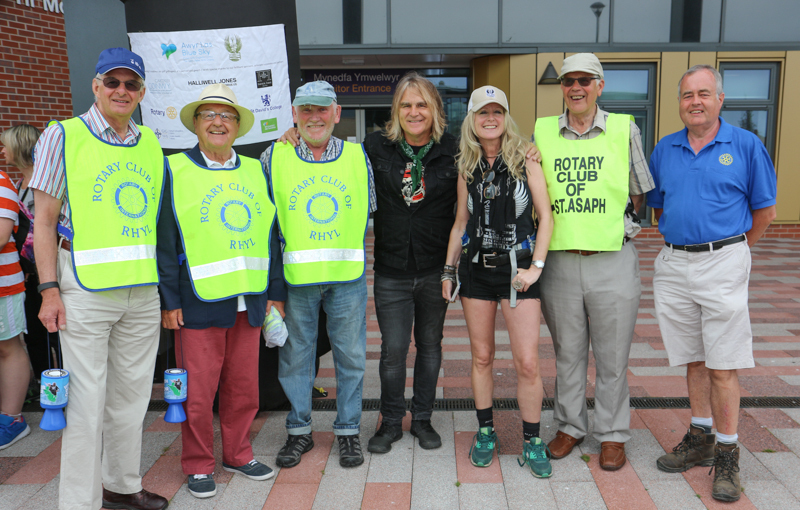 It was powerful stuff that could only have been followed by one man, the man who brought all three themes together in one song – Mike Peters. 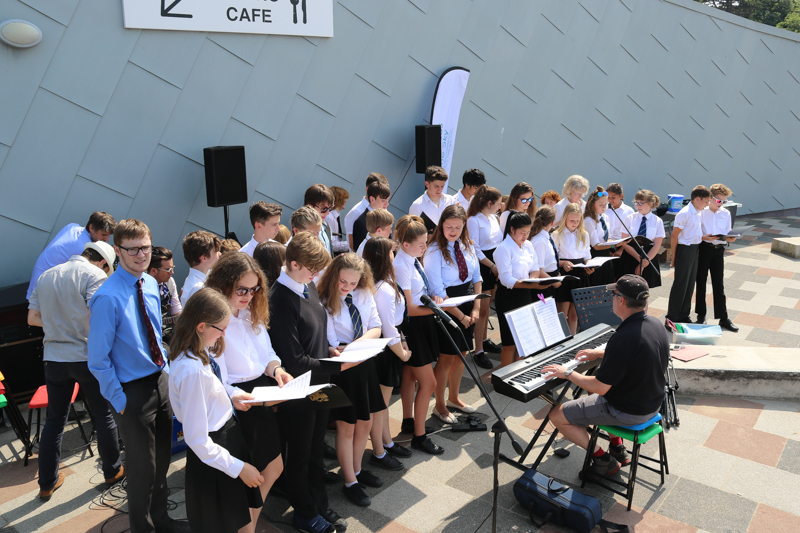 ‘Strength’ with it’s chorus refrain of ‘Give Me Love, Give Me Hope, Give Me Strength’ rang out through the room and into the hearts of everyone in attendance. 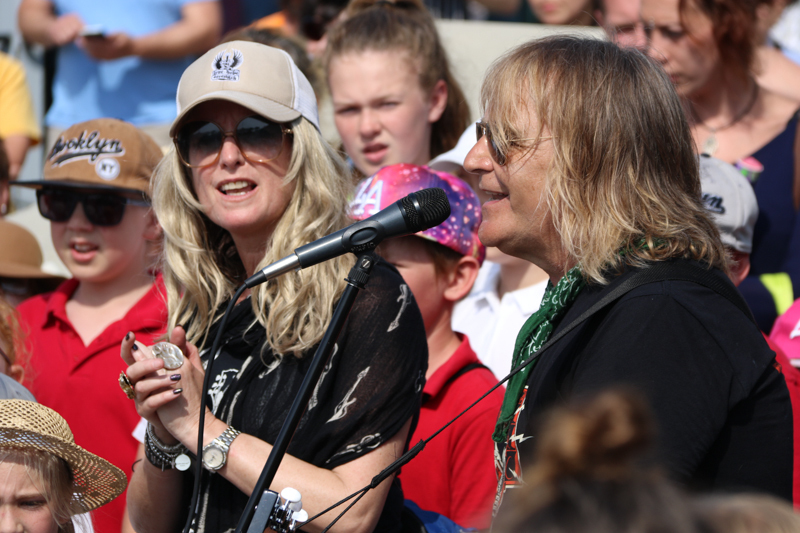 After a moving tribute to the courage of his wife – Jules in her own breast cancer journey, he then spoke of how effective the appeal is becoming. 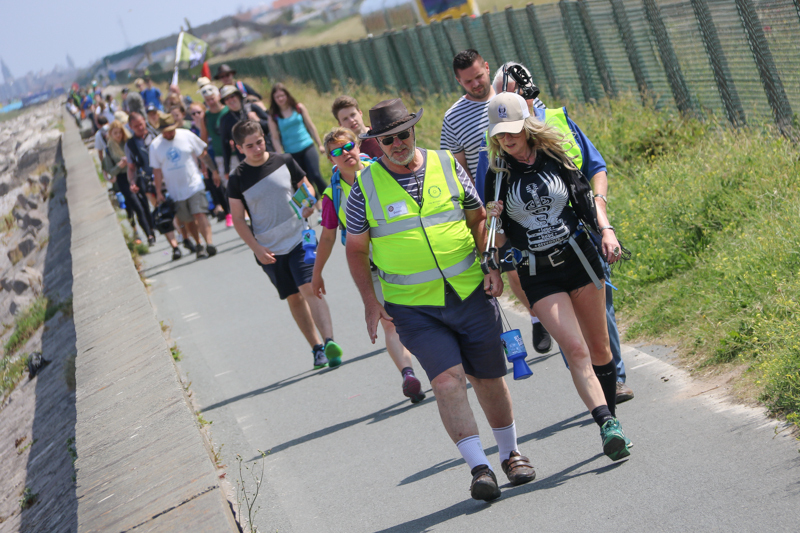 With each and every day of the walk strengthening the core message coming out through the social media, news outlets and general well wishes generated by the campaign so far, Mike was able to say that with the support of so many people from all walks of life and from all across Wales, the appeal is on course to reach it’s intended target of £351,120 and that every penny raised will go towards supporting frontline cancer services throughout North Wales. 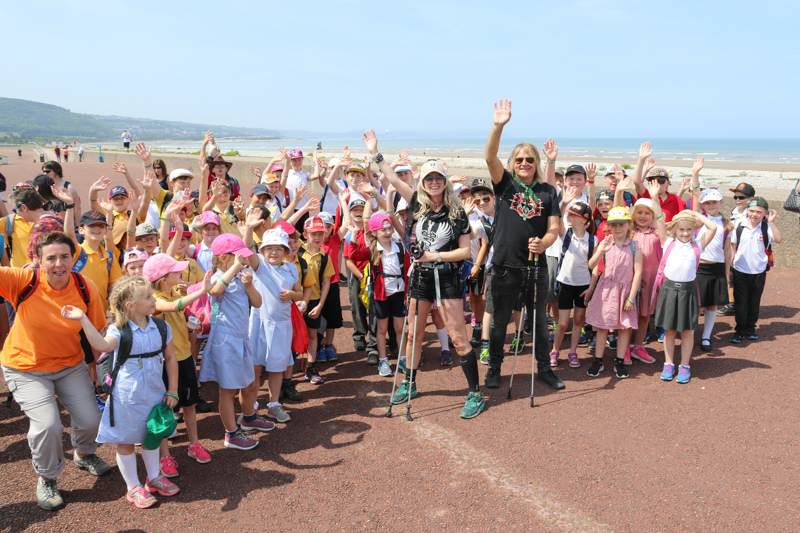 Day Seven will continue at St. David’s College, LLandudno, along the beachfront and around the Great Orme to the harbour front in Conwy.